Step 1: USB will need to be plugged in for power. Then plug it into a pc or Mac with the WiFi disconnected. Step 2: Open the browser, enter http://vonets.cfg or enter the IP address of VAP11G-300: http://192.168.254.254. Step 3: After you entered into the browser, it will show you the WIFI hotspots signal, you can choose your WIFI signal, then click "Next". Step 4: Enter the correct password of your WIFI signal and confirm it is correct. Then click "Apply" and the setting is finished. After reset the device, you can use this WIFI bridge. Connect Your Set Top Box such as sky hd box, apple TV, Freeview box to your wi-fi network. Enables you to watch Sky Anytime iBBC, net flex on your TV via wireless wifi network. Complies with IEEE 802.11g, IEEE 802.11b standards. Wifi Enabled: Provide Wireless solution to network connection building without network cable. 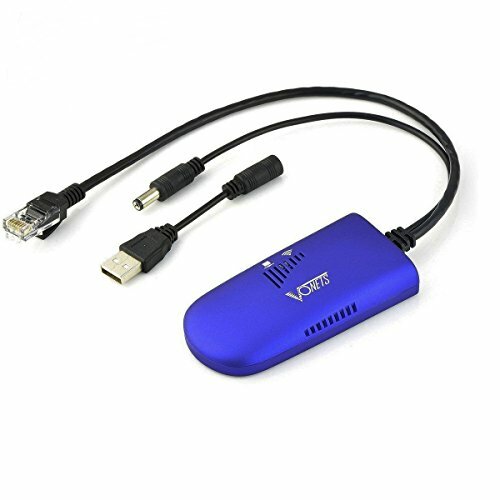 Wide Usage: Works with any network enabled device - TV, DVR, game console or home A/V device with Ethernet port. Support 2.4 GHz WLAN networks, 300Mbps rate of transmission. Also support WLAN security with WPA2, WPA and WEP (128/64)security access. No Driver and System Operation Requirment Needed.